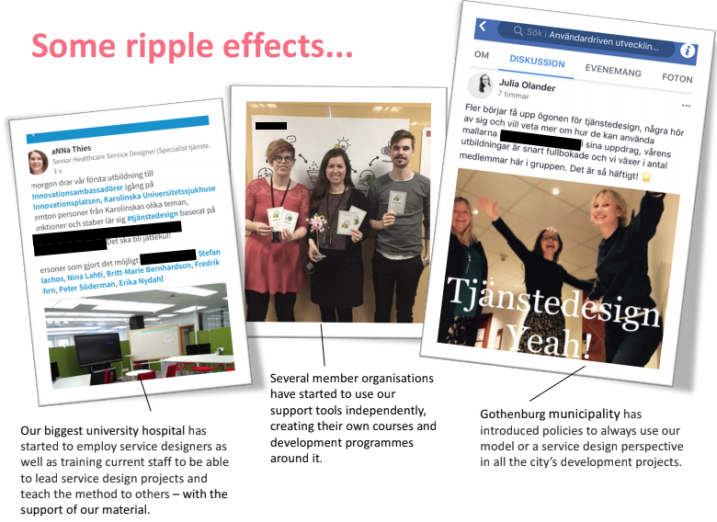 Innovationsguiden is an ongoing project that aims to support and reinvigorate the Swedish public sector in collaboration with citizens through service design. This is done by providing various forms of support to municipalities, county councils and regions to work with user-driven innovation in their development work. Our client is a national members and employers’ organisation for local government in Sweden. Our brief was to provide support to public organisations who wanted to strengthen their employees' innovation skills and create new and better public services based on user needs. 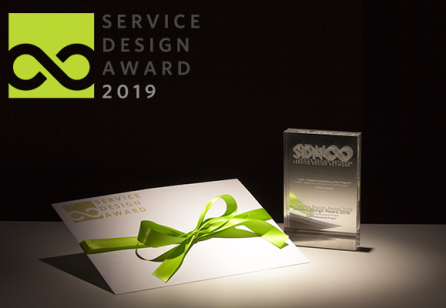 The Service Design Award is currently open for submission again. 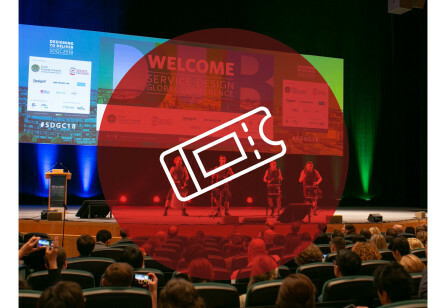 Submit your project for a chance to win and present at the Service Design Global Conference in Toronto this year. 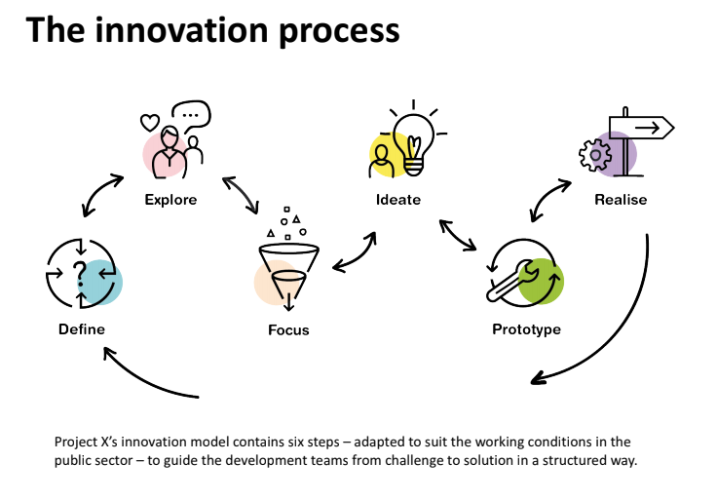 Our project Innovationsguiden aims to introduce and spread design thinking/service design as a means to develop smart and innovative services in the public sector. 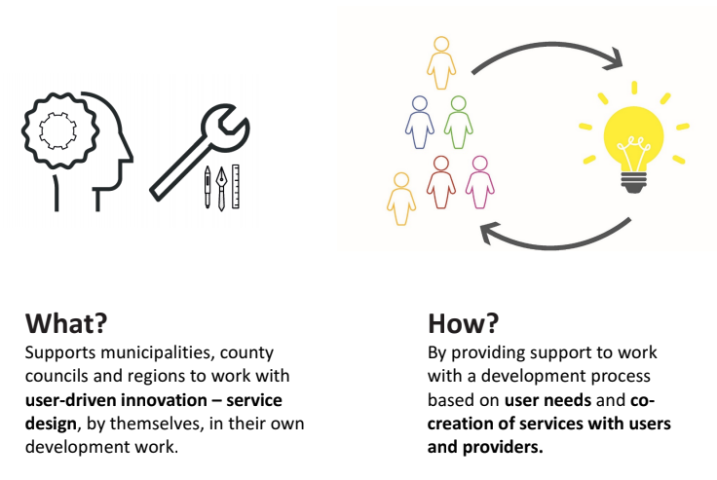 This is done by providing various forms of support to municipalities, county councils and regions to work with user-driven innovation in their development work. In a time when public services are under increasing strain it is more important than ever that we put our resources toward those services and activities that have the greatest impact. country, who in turn consist of a large variety of welfare and public service providers, with citizens as their users. easily scalable and not involve excessive costs in the form of process support etc. Project X is in many ways one long iterative process, where we continuously adapt and adjust our offer to better answer to our member’s needs. However, there was naturally extra focus on more organized research and user feedback at the beginning of the project. Innovation), diytoolkit.org, innomed.no. How could we learn from research and other successful organisations in these fields? We also organized two workshops with the National Network for Design of Health and Welfare Services, with members skilled in and/or interested in service design, working in municipalities, county councils and regions. By working with an already established network we could get started without much delay from planning and reaching out to our member. It was also helpful that the network members already had an interest in spreading service design, and an understanding of the obstacles and difficulties that we needed to address. The two workshops were conducted with a total of 40 participants from the network. By identifying their own obstacles/opportunities and through idea generation methods, the participants helped us understand how our support model could be designed. By working with interest mapping we could identify different types of players who could need different types of support. An innovation model and a plan based on the service design process was then developed for the target group and was tested in a second workshop with members from the network. Input and feedback from the workshop was used to further adapt and adjust the model. Insight: The public sector often has bad experiences of consultants who speak "design" and use foreign private sector examples that are difficult to relate to. Today our project has been incorporated into our client’s organisation, so their members are also our members. Insight: Development work almost always take place parallel to other work and the participants may noth ave much time to set aside for it. How we addressed it: We present a simple process to follow and hold on to, with "bridges" so the groups easily (using reflection and control questions) know if they can move on to the next step or not. By including simple templates for each step, you can always start where you left off. Insight: Many people find it difficult to "bring home" theory and put it into practice. How we addressed it: Training days with a lot of learning by doing, where you can really try out methods and exercises before you do it “at home”. Practical templates that are engaging and easy to use for beginners. 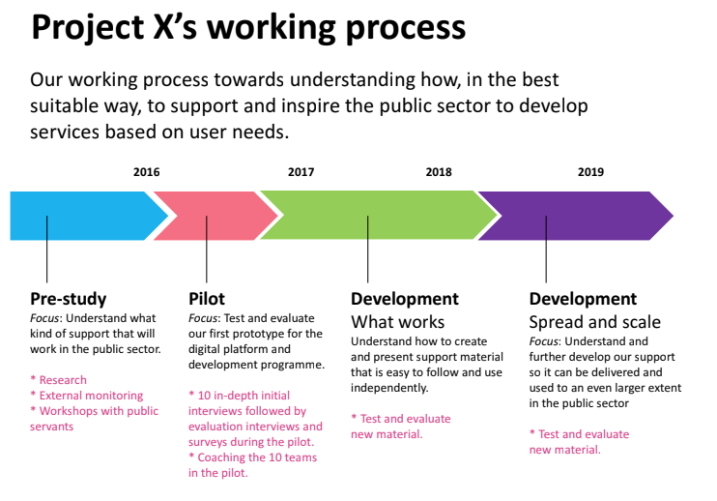 Our pre-study identified an increasing demand for practical tools and guidance to work with service design in the public sector, so we decided to live as we learn and launch a prototype pilot programme to test the model and setup hands-on. In the pilot we could work iteratively and continue to develop our processes and tools, together with the participating teams. An important goal was to develop easily used templates for methods. These templates were sometimes derived from established service design toolkits, such as diaries, service safaris, user journeys, observations and interviews, which were adjusted and translated. Others were developed from scratch to suit our target group, mostly focused on challenging perspectives, encouraging new insights and creating bridges between steps. The pilot was run with ten innovation teams, each consisting of 4-7 people (60 in total) from different municipalities/county councils, that signed up to test the model and outline of the development programme by working with their own chosen challenge during 8 months. Before the start of the programme, all project managers were interviewed about what type of support they initially saw that they needed in order to work independently with their projects. We then tested a web-based support platform complemented by training through workshops and coaching. 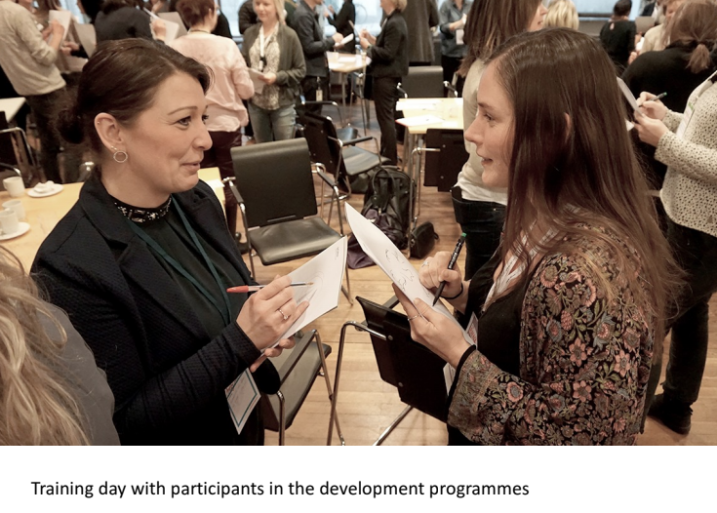 During the pilot programme interviews with project managers and digital evaluations were conducted to see how they used the various means of support offered (films, coaching, workshops, website) and how they perceived the process, methods and way of working. Insight: Many of the teams were not only new to development work, but also to working within projects, team work, scheduling etc. How we addressed it: We added a team block during training day 1, with associated method templates and tools: “stinky fish-happy turtle” (to acknowledge fears/hopes), team rules, planning templates etc. Insight: Our users have very different backgrounds and experience, many are beginners. Need for support varies. How we addressed it: We have developed various types of support. Our digital platform with reminders, rehearsal exercises and templates can be used independently by those with more experience. Beginners are offered “hand holding”, training and coaching throughout the development process. During the pilot, the request came to learn the process quickly so we developed our 2 day "crash course in service design." Insight: “Am I really allowed to fantasize during work hours?!”. This quote from a programme participant illustrates how large groups of public servants rarely get to ideate and use their creativity, and they have few tools to do so. There is lots of inventive potential to unleash. How we addressed it: We do not underestimate the value of having fun while learning and doing new, sometimes scary, things (like talking to users). Things like energy exercises, playing music and simple and aesthetically pleasing templates are used to increase motivation and dedication. We continuously ask ourselves “How do we engage our users and fill each element with as much joy as possible?”. Insight: Many teams experienced a lack of mandate and assigned time to work with their challenge. Teams without some kind of senior management involved had more difficulties gaining an understanding for the project and anchoring a solution in the organization. How we addressed it: We added a requirement to sign up with at least one team member with a management/leader function. Leadership training was included during training days, as a parallel “track”, focusing on getting the leaders to pave the way for the teams in their own organizations. Insight: Many teams were signed up by senior management and entered the programme without a clear sense of why they were there. This often leads to poor commitment and/or motivation. How we addressed it: During training days we work to strengthen the team’s feeling of ownership of their project, the process and the results. New templates were developed to help set personal, team, and organisational goals and to find a challenge that addresses real issues that matters to the team and their users. They own their project and make the decisions, we are only there for their support. Insight: Initial directives from management can hamper innovation efforts (eg. they already have a solution in mind), making it difficult for the group to challenge themselves. Management sometimes expects quick results within a certain area and are not open to changing the initial brief/problem formulation. How we addressed it: We work with the leaders so they feel safe to encourage and support a culture of exploring and testing. It is now mandatory for management to follow the project team‘s journey so they understand what they discover and the choices they make during the process. The support that we have developed during the last couple of years is centred around a step-by-step guide through a development process. The model is divided into six step - Define, Explore, Focus, Ideate, Prototype, Realise - based on user-driven innovation and service design. A digital platform with step-by-step instructions, templates and films, freely available for all participants in our programme and courses, as well as anyone else who wishes to use it on their own/DIY development work. compare experiences and exchange knowledge with other teams. Each team is assigned a coach with knowledge of the service design methodology that can guide them and be used as a sounding board. 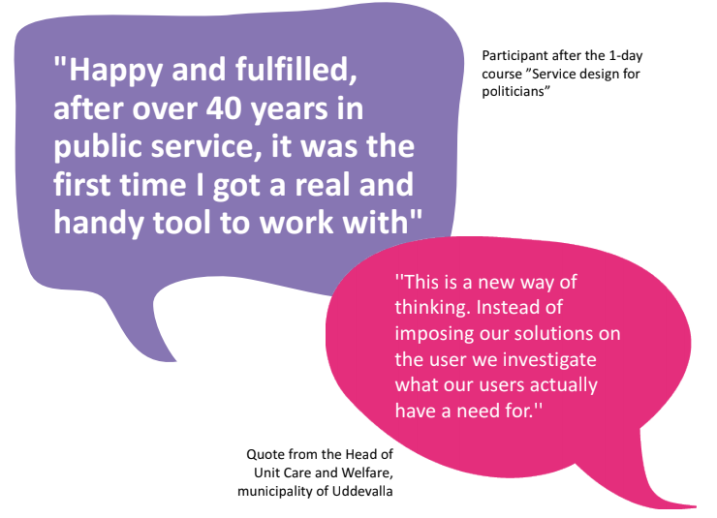 Crash courses in service design (2 days) designed for public servants/employees wishing to learn more about service design as a means to work with user-centred development in their organisation. Participants go through all 6 steps in the process with a fictive case. Service Design for Politicians and Leaders. A brief introductory course that works as an eye opener. We talk about the value of creating a permissive culture and of testing ideas with users. The course came to fruition after we saw the difficulties our teams had when their leaders/politicians lack an understanding of this. 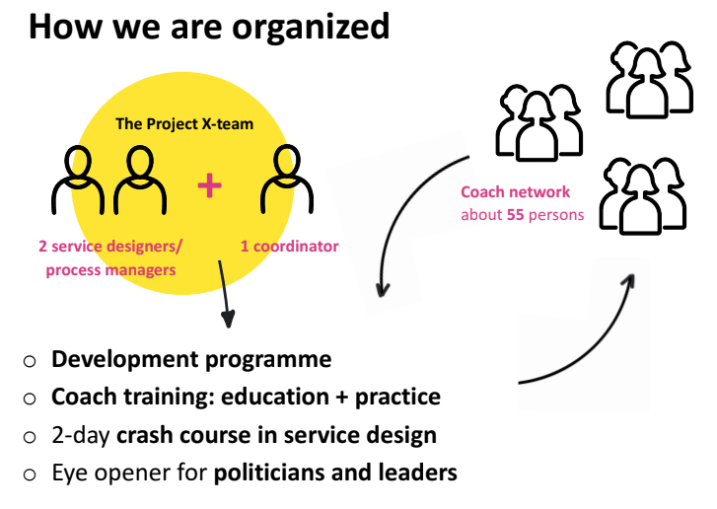 Our development programme also entails a need for a network of coaches with service design experience. We have therefore conducted a number of coach training courses, to ensure coach capacity and quality. The network today consists of 55 coaches working within the public sector around the country who are able to coach teams throughout our model, either inside a development programme or in independently run projects. 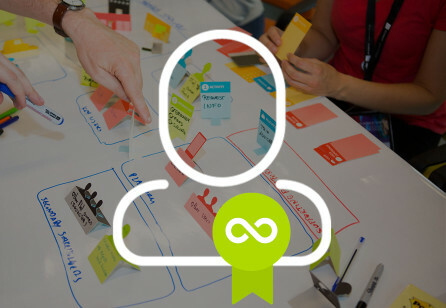 The possibility for our members to learn the service design process by tackling a real-life challenge has been a widely successful method to inspire a more long-term change in the participants’ mindset, to make them want to keep developing the services together with their users. This spreading of design thinking in the development and delivery of public services is perhaps what we see as the greatest benefit for the customer and their users. Even though the solutions that are developed are of great value to the users, the learning process of the teams can make an even greater impact in the long run. Through us our members get access to a working method that creates value and engagement for their organisation, their employees and their users. Our development programme, courses and easily accessible materials and concrete tools make it easy to involve employees at various levels in development work and to start working together with citizens to create better services. For examples of such services, see the Impact chapter. support, members can use it in the way that suits them best. Additionally, service design as a mindset is used to a greater extent within our own organisation. contribute to spreading methods and ways of working on a broader international scale. The interest for our initiative - our step-by-step instructions and accompanying templates, training, films etc, is increasing each day throughout the public sector. The idea is that participants in our programmes and courses (close to 1000 people) will pass the work method on within their own organisations throughout the country, which has already started to happen. 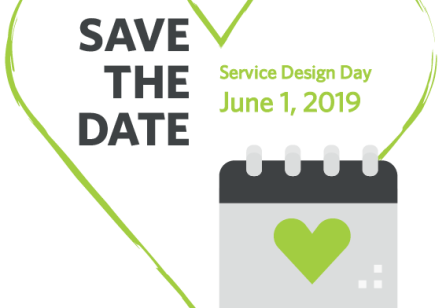 We also see that a growing interest for service design, in general, has gone hand in hand with our (client’s) members’ involvement in the project. This is also happening outside of our member base, within government agencies and private actors. This shows the potential for our support tools to be used by a wider audience. 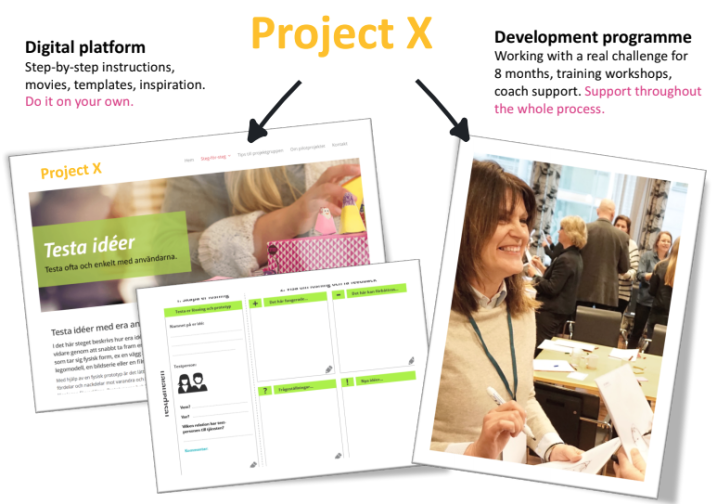 Our project is definitely contributing to a growing buzz around service design in Sweden. Since 2016, around 130 teams (700 people) have participated in our development programme, from close to 100 different municipalities, regions, and national organisations from the public sector. 220 people have participated in our crash course in service design. We have created a sought-after service for our client’s/our members, and we see examples everyday of how it helps develop better public services around the country as well as spreading service design as a go-to approach for development work, which is what we set out to do. Some member organisations have started to use our support tools independently, creating their own courses and development programmes around it. Some have even introduced policies to always use our model or a service design perspective in all development projects. Others have started to employ service designers as well as training current staff to be able to lead service design projects and teach the method to others. We are even being contacted for advice from members who wish to begin public procurement processes with service design agencies (see above for similar impact on market as a whole). Evaluations from the pilot shows that although the teams rarely develop any radical innovations, their solutions are still of great value to the users. The participants’ learn a new way of working which encourages a change in mindset and willingness to change. Meeting users and learning how to systematically understand their needs creates a driving force and joy at work for employees working with the model. Past beliefs about what is important are questioned and fundamental issues in service delivery have been revealed, and the users often give positive feedback to the teams because they feel involved in the development of the services that affect them. As for concrete services that have been developed in our programme, there are more than there are teams, but below are a few examples. The challenge: the team wished to increase the sense of safety and involvement among their users - senior citizens with some sort of home care service. The process: 16 seniors, half with home care and half without, were involved to share their daily lives through diaries, which were followed by in-depth interviews. Some insights confirmed previous beliefs about the users, and some were new. A central finding from the diaries of seniors with home care was that it created a feeling of insecurity to not know who was coming to help them. belief in service design as a method within the organisation. The challenge: the team wanted to improve their services for children who were placed in family homes. The process: The team interviewed 10 family home placed children and adolescents between 11-18 years and discovered the need for a better introduction and information before being placed in a new family home. There was a lot of anxiety deriving from having no or little information about the placement and getting the information too late in the process. These insights made it clear that better delivery of information could improve the user experience. The solution: The team, together with the children, designed a "welcome to us" booklet to make the children feel more involved and safe before a placement. The idea was tested through a simple paper prototype and adjusted according to the user feedback. The booklet is now being used by all social services in the municipality and includes information such as pictures of the family home, an introduction of family members and pets, a map, WIFI details, communications etc. A local health centre discovered that they had many patients with simpler medical needs, so they introduced a new section staffed by nursing assistants with a separate booking system, making the service better for both those patients and those needing to see a doctor or a certified nurse. A group of centres for senior immigrants are using Skype so participants can join or listen in on activities from various locations. make our support more accessible and easy to use and spread in our user’s own organisations. This scaling and spreading is crucial for us to reach our long-term goal – to make service design a natural part of public sector development work, and we need to approach this on different levels. By developing a “train the trainer”-course we empower our more mature users (this group is growing rapidly) to implement user-driven innovation within their existing structures, and to some extent to lobby for changes needed in those structures. By holding courses for leaders and politicians we help to pave the way for cultural and structural changes that need to be made. If we can strengthen the competency and understanding for service design in-house, public organisations will not only be able to lead their own projects but also become better clients who can identify the need for external consultants. 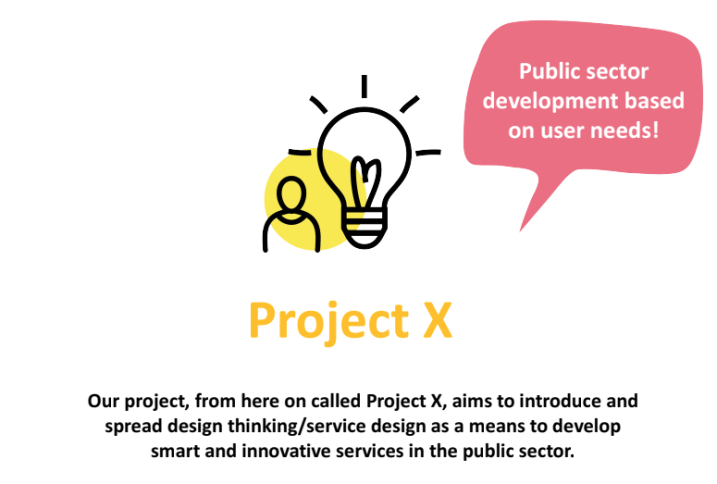 Our main takeaway and impact from the project is that the public sector needs service design to meet the demands of the future. By establishing a culture of trust where it is allowed to try and sometimes fail, it becomes easier to see citizens as resources and begin to co-create services. We are confident that we have only seen the beginning of the ripple effects from that kind of change in mindset. In the long run this has the possibility to change the whole approach to development work in the public sector. Also, one should not underestimate the power of having fun while doing the work!